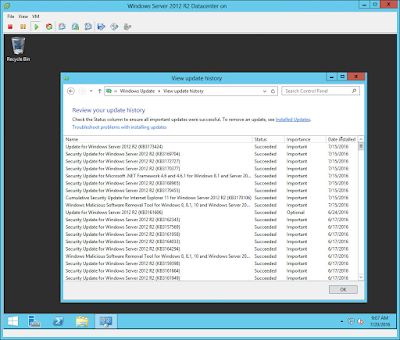 Update: I've tested and now use this on a Windows Server 2016 VM template as well as 2012 R2. I don't know about you, but I "love" having to maintain things manually and wasting my time. Good news is that it only takes 200+ updates and hours of wasted time to patch a fresh installation of Windows Server 2012 R2 server. One solution we've decided to streamline this task is to maintain a patched virtual machine (VM) template that has the most current Windows updates needed. "That's a great idea, but you're still having to maintain a VM template." you might say. Yeah, I don't have to maintain it - my scheduled task that kicks off a PowerCLI/PowerShell script maintains our VM template. I've been using it for the last few months with success, so I figured its time to share - once again. Note: I've only been testing this on a Windows Server 2012 VM template. Update the parameters with all your relevant template, location, etc. and if you want a post copy of the template to kick off.